Bob Parsons was recognized as a Smart 50 honoree for his leadership at the helm of Dismas Distribution Services, a Columbus-based third party logistics value-added services provider serving some of the region’s leading retail and apparel brands. Presented by Smart Business Magazine, the annual Smart 50 Awards recognize the top executives of the 50 smartest companies in the region for their ability to effectively build and lead successful organizations. After assuming his current position in 2011, Parsons led Dismas to more than 500 percent revenue growth in less than four years – success he credits to the three-year strategic plan established in collaboration with the company’s board that addresses everything from services and technology to operations and staffing. 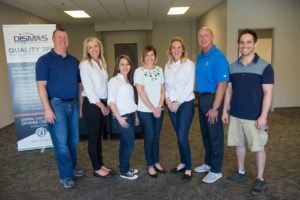 The company’s culture, recruitment and retention campaign is designed to attract and keep employees that live by Dismas’ values and has contributed to a decrease in employee attrition. The award also recognizes the company’s recent innovations in customized garment and apparel services tailored to meet the needs of their growing client base.